The RSNA Image Share Validation program was developed to set the standard for consistent, effective and efficient image sharing in the marketplace. The RSNA Image Share Validation benefits patients and providers with improved efficiency, reduced costs, enhanced quality of care, and standards-based interoperability to spur innovation. The vendors who achieve the RSNA Image Share designation have demonstrated compliance to quality standards determined most effective for accurate and efficient exchange of medical images including those used in the eHealth Exchange. 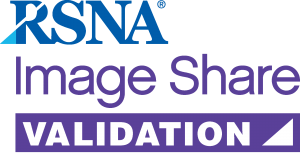 Vendor products that successfully pass a rigorous set of required conformance tests receive the RSNA Image Share Validation seal to communicate to current and future customers their image sharing capabilities. Ready to improve your image sharing capabilities? Learn more about the RSNA Image Share Validation program.